Where did you spend last night? On or in the truck, trailer, the tack room where the heater went out? Will the boots stay on in snow and mud if you use cold or frozen glue? 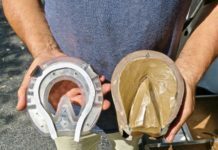 As the competition season for many riders gets slowly going, some riders are considering gluing Easyboots on their horse’s hooves. 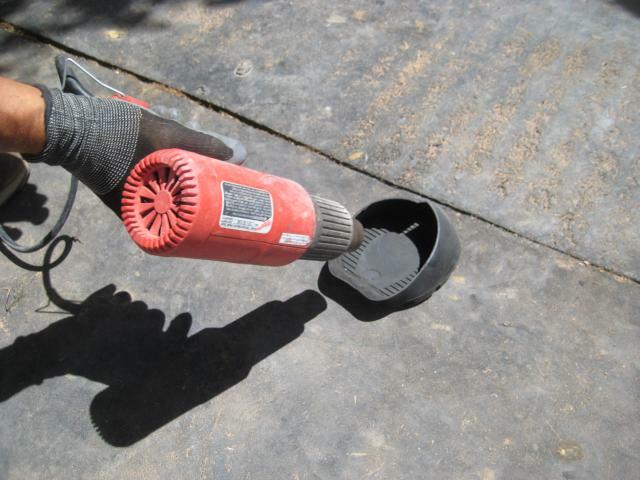 With frigid temperatures still prevailing in many parts of the country, successful gluing will depend on thorough preparation of Glue-On Horse Shoes and hoof glue. After many mistakes made by myself and after trying many different gluing methods, what proved to be the most successful method is a combination of VETTEC ADHERE or SOLE-GUARD for the sidewall of the boots and Goober Glue (or similar glue) for the bottom or sole area. All these glues work best when used at room temperature. Goober Glue will get stiffer at cold temperatures and might not come out of the tube. Same with all the VETTEC glues. 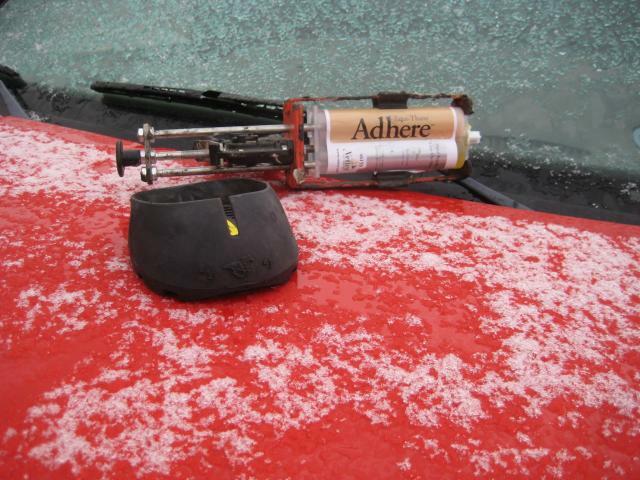 When Vettec glues are exposed to sub freezing temperatures, it will not destroy them, but one should refrain from heating them up too quickly. Best to slowly warm them up to room temperature. ADHERE will thicken a lot below 60 F. Best temperature for Adhere is between F 65 and 85 degrees. Sole-Guard is generally thinner. At cooler temperatures it might be better to use Sole-Guard. Its gluing characteristics are similar to the Adhere but it runs thinner. The cooler the glue, the slower the setting times. During the winter months we need to take special care to thoroughly dry the hooves before gluing. 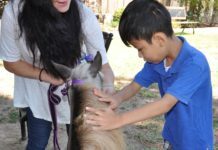 If the boots are cold, warming them up will make them more pliable and easier to slide onto the hooves. The glue will also stick a lot better to them. After applying the Goober Glue to the bottom of the boot, we evenly spread the Vettec Glue to the side of the boot, but only to the top half. 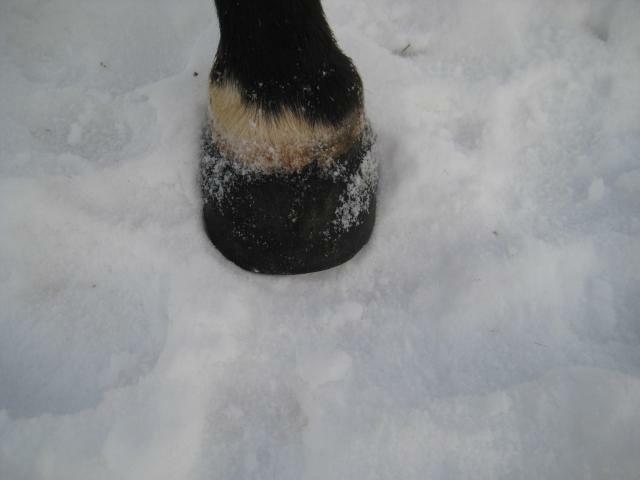 When sliding the boot then onto the hoof, the glue will then spread evenly over the whole side wall. 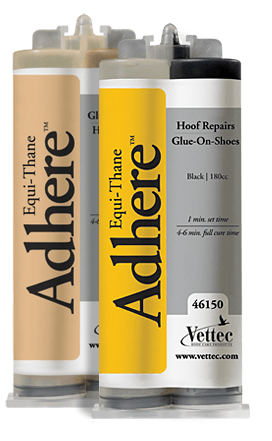 Applying too much glue to the walls or too low towards the bottom and you run the risk of pushing some Vettec Glue to the sole area, which in turn could cause pressure on thin soled and tender hooves. Apply the Vettec glue just to the top half of the boots side wall. In the sole (frog) area the Goober Glue is already added. Like we stated many times, success in gluing comes from proper preparation of hooves, boots and glue. 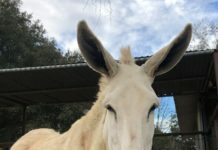 Cleanliness and dryness are the secret to success. Then the boots will stay on for weeks without doing any harm to your horses hooves and without falling off in the middle of a ride or race. During the winter months, we add the third ingredient, which is warmth. 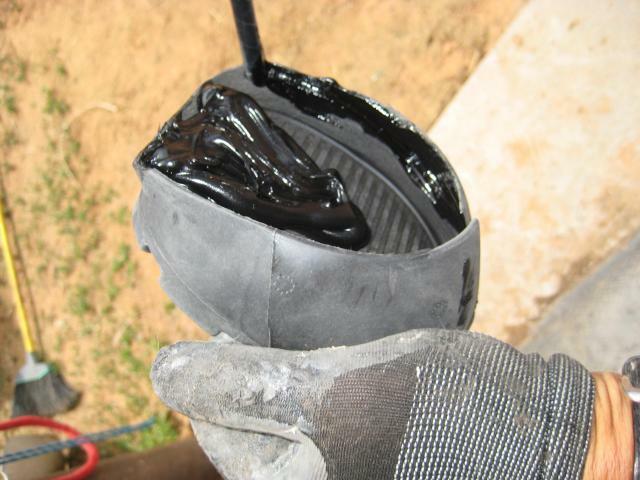 At the Global Endurance Training Center we are gluing on EasyCare Glue ons and Glue-On horse shoes all year long. 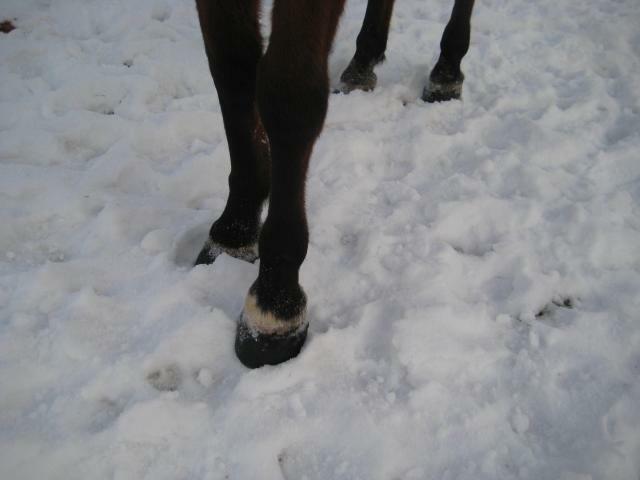 And we are using hoof glues in all kinds of weather and temperatures. It is taking a some effort to pry them off after wards. That is how it is supposed to be. Clean, dry and warm are the magic words. This boot will stay on no matter what the elements are.